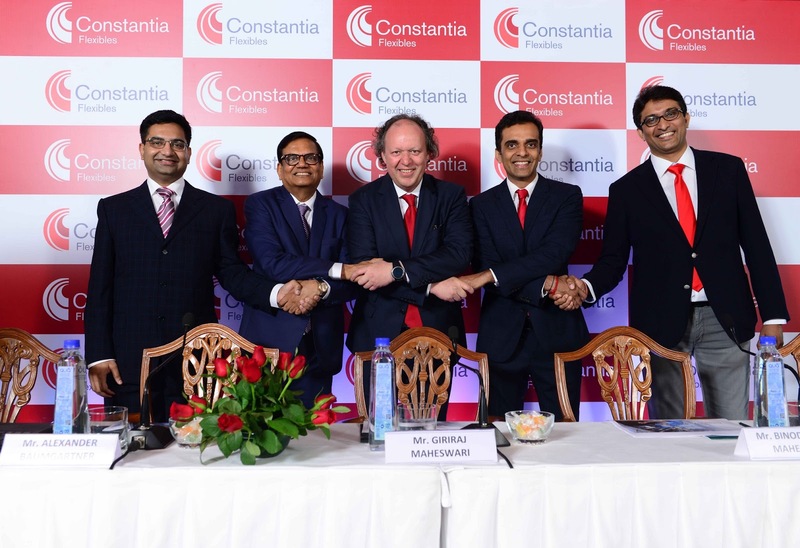 Constantia Flexibles, the world’s fourth largest flexible packaging group, is aiming to double its sales in India within the next five years. This is the result of its recent acquisition of a majority stake in Creative Polypack and its group companies, as well as expansion plans of its existing subsidiary Parikh Packaging. Through the acquisition, Constantia Flexibles is already India’s third largest flexible packaging group and is expecting to reach the c. 200 million EUR sales mark (INR 1,600 crore) in 2022, through market growth and ongoing investments. The flexible packaging market in India is expected to grow by more than 10 percent in the next five years, driven by the megatrend urbanization and the expansion of the retail sector. India has become the third largest economy in the world after USA and China, with high single-digit GDP growth, major infrastructure projects in roads and ports, a simplification of the tax system and rising private consumption, especially among the burgeoning middle-class. Baumgartner was joined at a press conference in Mumbai by Pavan Parikh, Managing Director and founder of Parikh Packaging, B.K.Maheswari Managing Director and founder of Creative Polypack, along with his son Giriraj Maheswari, Joint Managing Director. Creative Polypack Limited was founded in 1986 and is one of the leading flexible packaging groups in India. It achieved sales of about 75 million EUR in the business year ending March 31, 2018, and currently has about 850 employees at eight production sites in Baddi, Kanpur, Kolkata, Assam and Puducherry, in northern, eastern and southern India. It manufactures film-based flexible packaging for the food and home & personal care (HPC) industries, as well as paper-based soap wrappers. The company serves the leading domestic and international consumer goods companies in India. Creative Polypack intends to invest on average 6 million euro per year (INR 50 crore) in new production capacity, as well as other infrastructure, at its Kolkata, Baddi, Kanpur and Puducherry sites, in the coming years. Above all, it plans to double its capacity at the newly-established Assam site. Before the acquisition of Creative Polypack, Constantia Flexibles was already a leading supplier of film-based flexible packaging for the Indian market since acquiring Parikh Packaging in 2013, which is based in Ahmedabad, western India. It has more than 500 employees and achieved sales of roughly 35 million EUR in 2017, serving the food and HPC industries. Parikh Packaging is investing a double-digit million euro amount (INR 100 crore) in a new greenfield site in Ahmedabad, which will be home to a polyethylene blown film extruder, high-definition Flexo printing press and laminators that will produce high barrier laminates that can be fully recycled. The extra capacity will come on stream in 2019. Major FMCGs are demanding the highest level of sustainability for their packaging material and the new investment will help them to comply with upcoming Indian Plastic Waste Management (PWM) regulations that promote only fully recyclable flexible packaging. The investment also fits in well with the Indian government’s campaign Swachh Bharat Abhiyan (SBA) to clean the nation.